CAMARILLO, CA--(Marketwired - Oct 28, 2013) - Salem Radio Talk Show Host Don Kroah has been referred to as Doctor before, but now he really IS one. 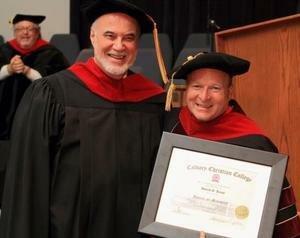 Salem Communications Corporation ( NASDAQ : SALM ), a leading U.S. radio broadcaster, Internet content provider, magazine and book publisher targeting audiences interested in Christian and conservative opinion content, today announced that Kroah was presented with an earned Doctorate of Ministry Degree from Calvary Christian College in Waldorf, Maryland by College President Dr. Timothy Wood on October 7th . Before receiving the honor, Kroah delivered the Commencement Address to the graduating class of 2013. An alumnus of Valley Forge Christian College, Don's previous academic work included studies in psychology and philosophy at the University of Southern Maine and in journalism at Regent University's School of Communication and the Arts in Alexandria, VA.
Now in his 16th year as host of The Don Kroah Show on 105.1 WAVA-FM in Washington, DC, Don joined Salem Media of Virginia on October 20, 1997 following 34 years of fulltime pastoral work in Maine. While there he also worked extensively in general market radio as a news director, news anchor, commentator, and morning show host in the Augusta, Waterville, and Portland markets. In 2006 Don was given the coveted Andy Anderson Award for Radio Talk Host of the Year by WAVA's parent company, Salem Communications. The Don Kroah Show has received multiple-year awards at the Annual Awards Events of the Virginia Association of Broadcasters. In 2010 Christian Solidarity International also presented Don with its Radio Broadcasters Award "for unwavering dedication and commitment to the people of Southern Sudan." In addition to having traveled to numerous countries on behalf of World Vision, Food For The Poor, and the Bible League, Don also conducts regular trips on his own time to nations in Africa to help train, strengthen and equip pastors and churches there. The Don Kroah Show can be heard Monday through Friday from 4 to 7 p.m. on 105.1 WAVA-FM and live on the Internet at www.wava.com. Salem Communications Corporation is the largest commercial U.S. radio broadcasting company that provides programming targeted at audiences interested in Christian and conservative opinion content, as measured by the number of stations and audience coverage. Upon completion of all announced transactions, the company will own and/or operate a national portfolio of 99 radio stations in 38 markets, including 61 stations in 22 of the top 25 markets. Salem also programs the Family Talk™ Christian-themed talk format on Sirius XM Radio, channel 131. Additionally the company operates Christianradio.com. In addition to its radio broadcast business, Salem owns an Internet and a publishing division. Salem Web Network is a provider of online Christian and conservative-themed content and streaming and includes websites such as Christian faith focused Christianity.com, Questions and Answers about Jesus Christ at Jesus.org, Christian living focused Crosswalk.com®, online Bible at BibleStudyTools.com, Christian videos at GodTube.com, a leading website providing church media at WorshipHouseMedia.com and Christian radio ministries online at OnePlace.com. Additionally Salem owns conservative news leader Townhall.com® and conservative political blog HotAir.com, providing conservative commentary, news and blogging. Salem Publishing™ circulates Christian and conservative magazines such as Homecoming® The Magazine, YouthWorker Journal™, The Singing News, FaithTalk Magazine, Preaching and Townhall Magazine™. Xulon Press™ is a provider of self-publishing services targeting the Christian audience.